Join us for this annual family celebration! 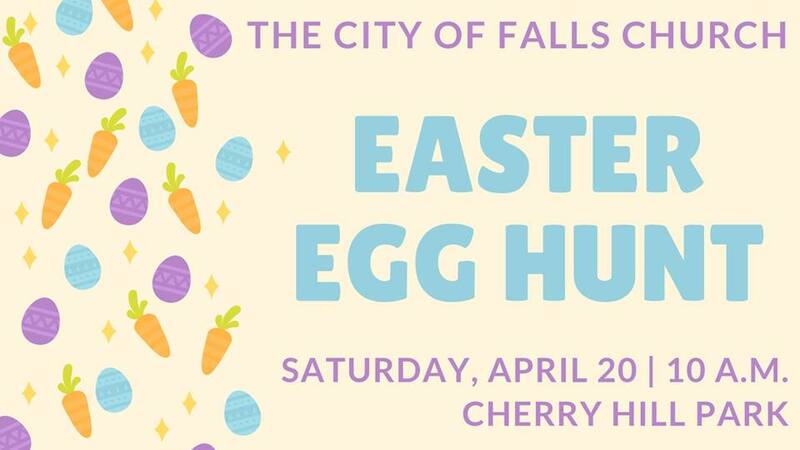 Ages 11 and under can hunt for candy and special eggs in Cherry Hill Park, followed by photo opportunities with the Easter Bunny. This is a free event. Visit www.fallschurchva.gov/parking for Downtown Public Parking options near Cherry Hill Park. In addition to scrambling for eggs, children ages 11 and younger participate in a free, make-your-own-candy-bag craft project. Thank you to Merrifield Pediatric Dentistry: Dr Monamie Ghatak DDS for sponsoring the craft activity and providing all the materials. The Great Lorenzo's Magic Circus will perform in front of the Cherry Hill Farmhouse Barn at 10:30 a.m. Learn to decorate eggs the old-fashioned way! Visit Cherry Hill Historic House and Farm and spend the afternoon naturally dying your Easter eggs. For $5 a person, they'll supply the materials while you decorate! Call 703-248-5171 (TTY 711) for reservations and more information. The award-winning Falls Church Farmers Market will be going on next door in the City Hall Parking Lot (300 Park Ave.) from 8:00 a.m. to noon.